This tour forum is designed for spoilers. If you're trying to avoid spoilers and you decide to come in here, you're taking your chances, and you enter at your own risk. Obviously, once the tour starts, we all have to be careful about what we post concerning the setlist. Absolutely no spoiler posts outside of this R40 Tour forum. This image shows the thread titles after they were edited -- they originally displayed the actual song title. Also, please keep song titles and concert photos out of your sigs and profiles. Lastly, please keep spoilers out of the meetup threads. Those are located in On The Lighted Stage section, and we don't want to spoil things for people who are discussing meetup plans. Edited by 1-0-0-1-0-0-1, 14 May 2015 - 12:31 AM. Another request on spoilers, it would be helpful that when you visit a thread with a spoiler topic (like the lerxst interview, for instance), people DONT reply with other, additional spoilers. A person trying to avoid spoilers is going to stay out of a thread marked "SPOILER" no matter what, right? So, if other spoilers are added to such a thread, it won't make much of a difference -- again, that's assuming the thread is marked as containing spoilers, like the "Lerxst Interview" one is. Unless I'm misunderstanding you? No, you're understanding me, and staying away from all spoiler threads is probably the best policy to avoid any unwanted info. Also, I understand how difficult it would be to contain additional spoilers that may come up in thread conversations. Guess Im being a bit subjective, as I already know two songs that will be played (that most of us know), and dont want to know anything else! Be careful about posting spoilers in threads that weren't started as spoiler threads, or are not marked as containing spoilers. If you want to post a spoiler, either start a new properly marked spoiler thread or look for an existing thread that fits your topic that is already marked "SPOILER". 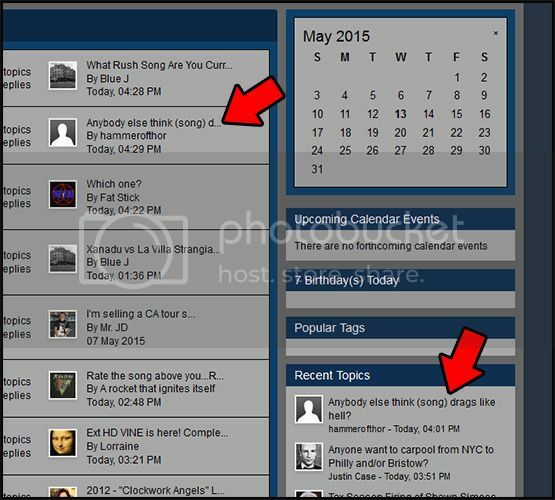 Again, when you come into this Time Machine tour forum, you enter at your own risk. But we can still try to contain spoilers wherever possible. I stuck "Spoiler" in my thread title so no one would click on it who wants to be surprised. Did I do the right thing? If I didn't, and someone saw it in the new thread section, they would click on the thread and find themselves in the section they are purposely avoiding. It certainly doesn't hurt to put "spoiler" in your title. When in doubt, go ahead and do that. At this point, as long as you post your thread in the R40 section, it is understood to be a spoiler thread. The problems start when people post such threads outside of the spoiler forum, or put actual spoiler content in their thread titles. I still see some dopes who are not following these rules. There should be some penalty for those who don’t follow the spoiler rules. I think their account should be disabled for a week if not more. Isn't this the second time johnnyonthespot's done this? Hey 73, just curious…if Tom Sawyer or 2112 were in a thread title, would it really be considered a spoiler? I mean, they get played every tour. IMO, the only two non-spoiler songs would be "Tom Sawyer" and "Spirit of Radio." "2112" gets skipped once in a while, and it could be a definite spoiler if they played more than just "Overture/Temples." Maybe he has other things on his mind and forgot. Yeah we dont need to be so heavy handed about this. I disagree but luckily for them it’s not up to me. At best, these people are simply inconsiderate and possibly absent minded and at worst they’re narcissists just don’t give a frak if they spoil something for someone. That’s just my two cents. Edited by TheBluePhoenix, 01 June 2015 - 06:36 PM. What some people call news, as song titles are regularly included in the press coverage of R40, some label as spoilers. Its like writing a newspaper article, and not able to reference the subject in the article title. Believe it or not, as I did it once (regrettably), that can be confusing. Its very easy to navigate the site and never touch the home page or new content page. That would be my strategy if I wanted to avoid the current Rush news... eh..spoilers. By not making that choice, one is allowing the honest mistake of someone else to impact something very important to your version of tour enjoyment. But thems the rules, so we do our best to follow. He was a little brash about it today, which wasn't necessary. Edited by Gabrielgil513, 01 June 2015 - 10:00 PM.